I have just spent three enjoyable hours listening to theme songs to cartoons from the eighties and I cannot even begin to describe how they make me feel. I was so loud and so exhuberant with singing along that Serge had to leave the room in disgust. And confusion. Because apparently he knows nothing of kickass 80s cartoons and it makes me feel like I don't even know who I married. You've never heard of Inspector Gadget? Who ARE you? I haven't heard these tunes in more than twenty years and they immediately bring back memories I didn't even know were locked inside my brain. Yeah, I've posted some really cool mom and baby pics but I am telling you what - this might be my favorite slideshow I've ever done for Babble. Seriously. If you've got some time to spare, immerse yourself in your past over here on 80s Flashback! Totally Rad Cartoons (and Theme Songs) You Grew Up With. By the power of Grayskull, I command you to read! I'm a Scooby Doo girl myself. Love that damn dog and his boy Shaggy. To get you all juiced for the awesomeness you are about to behold over on Babble go ahead and feast your eyes on Monica Butler circa 11-years-old. 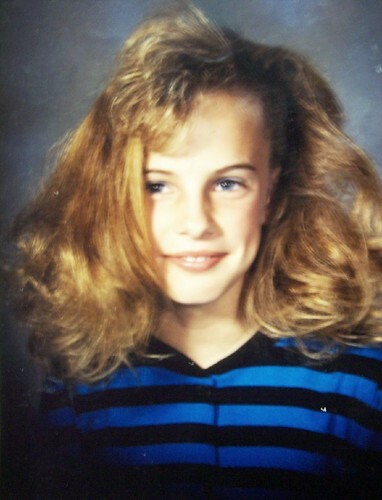 When your hair doesn't fit in the picture you should maybe realize you're a little heavy-handed with the Aqua Net, yes? As the great Shaggy would exclaim: ZOINKS!